Can PC Gamer's city survive four different mayors? This article was originally published in PC Gamer issue 318. For more quality articles about all things PC gaming, you can subscribe now in the UK and the US. Arguably the best city builder available right now, Cities: Skylines is a regular fixture in PC Gamer’s annual Top 100. It’s been further bolstered by DLC, updates and a huge Steam Workshop library of mods. Wanting to take a look at the breadth and variety now available, the PC Gamer team is embarking on a shared project to build a utopia. The AI civilians of a Cities: Skylines city aren’t capable of democracy, so we’re going to utilise the next best method: taking it in turns, regardless of experience. Each team member gets two years to craft their utopia. To make things interesting, we get unlimited money and all buildings are unlocked. But we also have to aim to make our city profitable, ensuring its viability should the infinite money bubble ever burst. UK mag editor Phil goes on a mod hunt. Opening the Steam Workshop, I spend a while playing with various district styles. My plan is to give each district a theme. I want vibrant, contrasting communities—pockets of cyberpunk technoliving next to medieval townships and fantasy wonderlands. But then I change my mind. After all, isn’t PC gaming one big melting pot—a conﬂuence of community and individuality? I hope so, because using district mods is complicated, and keeps making the game crash. Instead, I just download pages and pages of buildings that will automatically construct on any residential, commercial or industrial zones I lay. We’ve got neon skyscrapers, we’ve got classical architecture, we’ve even got a KFC. When I’m done, we’re subscribed to 528 items on the Steam Workshop. I open up Cities: Skylines and wait for a new map to load. It takes a long time. I christen this land ‘XxxxxxXxx’ in the hope that something clever will come to me once the city starts to take shape. I hit pause to stop the clock, giving me time to lay some bones. Roads are built, zones are designated, power and water is sourced. I build fire stations and schools and hospitals. I create suburbs in tidy rows. It’s efficient, but I soon get bored of forming grids. I’m British, and that means I’m used to cities that sort of fall together by accident. I start putting in curves and odd angles. 102 degrees! 84 degrees! I’m tearing the rulebook apart. I know from experience that I’m terrible at creating intersections that link the state highway to the sprawl of the town proper. Inevitably, I end up with an unworkable mess that causes massive traffic problems years down the line. To this end, I download Timboh’s Marvelous Interchange Emporium, the most popular mod collection on Cities: Skylines’ Steam Workshop page. I look through Timboh’s creations, but they’re all massive—far too big to fit into the space I have remaining. Instead I botch something together, once again ensuring massive traffic problems. I name this junction Please Fix This, in the hope that the next mayor will try to do better. I create a district for agricultural industry, named ‘Farming Simulator 2018’, and a district for nightlife and tourism, named ‘Just Dance 2018’. Then I set up a transport network consisting entirely of blimps. Finally ready, I unpause and wait for the magic to happen. It does, but slowly. Six months in, and most of my land is empty. I panic-build more roads and designate more residential land—I’d vastly underestimated how much you need to support even a small amount of industry and commerce. I drop taxes to 1%, tanking profits, but boosting growth. My tenure ﬂies by, and I’m largely happy with what I’ve created. I need to put the city in profit before handing it over—it’s not a utopia if you’re in debt, even if you’ve got an unlimited cashﬂow. I crank up tax, and turn down funding on all the public services. Good luck with that, Andy. I email him the save file, only remembering at the last second that I forgot to name the place. Section editor Andy tackles disaster. I take over from Phil and find a small, pleasant city buzzing with blimps, and I’m appalled. There isn’t enough sin in this town. I build a long four-lane road, which I name the ‘Alley of Sin’, and line it with clubs, commercial zones, and an enormous, garish casino. That’s more like it. People in this as-yet-unnamed city have somewhere to take a load off and indulge in some good old-fashioned hedonism. But to ensure the crime rate doesn’t get out of control, I build the police tower from Blade Runner—a reminder for all the crooks in the Alley of Sin that the future-police are watching, always. I notice that pretty much the entire city is blinking with the ‘abandoned building’ icon, and I realise that it’s because I don’t have enough citizens to staff all these new casinos and commercial zones. So I build a large high-density residential zone just off the Alley of Sin, which simply refuses to develop. Not a problem: I simply lower the taxes for residents to 1% and suddenly the tenants and homeowners come ﬂooding in. But, as a result, I’m starting to absolutely haemorrhage money. It’s a good thing it’s unlimited, otherwise I don’t think this place would make it through another year without collapsing. Suddenly, disaster. A meteor rains down from the sky, smashing into the industrial zone that Phil so carefully constructed, destroying buildings, starting fires, and leaving a bloody great crater behind. I actually like how the crater stays there. It’s become a landmark, and I’m annoyed the game isn’t sufficiently complex to allow me to charge people to come and see it. I repair the damage and get back to trying to make money. I build a stadium and a giant, gaudy shopping mall, which is making the city incredibly noisy. The roads are starting to get jammed up with traffic too, and the city is starting to look rather dystopian. Phil’s blimp system is cool and all, but I need a way for outsiders to come to the city and indulge in all that lovely entertainment I’ve so graciously supplied. So I build an international airport on the edge of town, which brings with it all manner of pollution, noise and skyrocketing operating costs, but surely the inﬂux of tourists will counteract that? I don’t know the game well enough to know if any of these strategies make sense, but I go with it. Pip can always clean up any mess I make. My tenure is almost over. Planes start taking off and landing in the airport, which is a good sign, but elsewhere in the city there are more job shortages and abandoned buildings sprouting up. I survey what I’ve created so far, and this is a very ugly city. I’ve been quite scattershot with my building and road creation, and the place is a damn mess. But I prefer these sprawling, messy cityscapes to the rigid, grid-like streets of the United States. There’s a problem, though. Many, in fact. I’ve neglected to build more sewage outlets and water pumps, and the city is both suffering a major water crisis and is backed up with tonnes of stinking sewage. I don’t have time to fix it, so I’ll leave it to my successor. Also, there seem to be dead bodies everywhere, lining the streets. I forgot to build a cemetery. Sorry, Pip. Deputy editor Pip adds whales. Figuring all of that out can wait though, because Andy’s version of leaving the city in profit involves a $34,000 deficit. My initial inspection of the city also reveals that at least one building is on fire and several buildings appear to be accumulating dead folk. I plonk an emergency cemetery into the first chunk of available space I see and throw down a few fire stations to bring the fire hazard rating for swathes of the city back into a safe range. I find myself doing similar crisis-management for all the city’s rating systems. It’s pretty straightforward for the first few but noise pollution seems to be a huge problem. I blanket-upgrade every single road in the main town hub to ones lined with trees to dampen the noise of traffic. The impact is nowhere near what I’d hoped, though. I’ve also destroyed whatever one-way systems Andy and Phil might have set up. Speaking of problems inherited from the last two governments, neither of my predecessors seem to have gotten round to naming the city. I christen the metropolis ‘Pipville’. This also doesn’t solve the noise pollution problem, so I try creating tunnels for the most congested routes; underground no one can hear you beep. I end up with one tunnel and one entirely missing segment of road which I accidentally upgraded into not existing. It’s at this point I lose my temper. You know what’s noisy? Living people. You know what’s really quiet? A necropolis. It’s a glorious diorama—a mysterious necropolis next to an equally mysterious whale-spewing crater. I find a cul-de-sac and install multiple cemeteries. It is blissfully quiet. I can feel the stresses of the city ebbing away as I pick out new trees and bushes from the Steam Workshop to decorate Pipville’s necropolis. Soon, lovely hibiscus bushes and cherry blossom trees are hugging the graveyards. Then I remember the whale. I mod the game to allow props and put a whale at the entrance of the necropolis. While adding additional whales (for company, of course) I notice their bodies hug the terrain. That means when I place them on the lip of a nearby crater they bend around the slope and look like they’re crawling out of the ground. It’s a glorious diorama—a mysterious necropolis next to an equally mysterious whale-spewing crater. In case the next player somehow misses ‘Necropowhale Zone’, I also leave a trail of whales going from the crater to the edge of the city. With my remaining months in power I build a canal in an attempt to fill the bottom of the whale crater with water. Ignoring the multiple instances of massive ﬂooding across the city, this is a resounding success. I end my rule in profit by making taxes 10% across the board and hit save. Good luck making sense of any of this, Samuel! UK editor in chief Samuel ushers the city to its final form. I want to extend the city in my time as mayor, and put my mark on this place. I’m going to build a new district that has high-end shopping and nice houses. I lay down some road to a quiet area of the map and build a pentagonal region that links to the Just Dance 2018 district. The site of my new utopia for bastards. How do you connect pipes again? I’ve forgotten. Everyone needs electricity and water and I’m not ready! I should’ve put the utilities down first. I’ve barely built my new area of the city and we’re over $30,000 in debt. I start to panic that my city is doomed to never break even, and I’ve only been mayor for two months. I don’t know how you demolish buildings in this game, but I bet doing that will balance the books a bit. Hey, what about this natural disasters panel? How about I just call in a meteor and pretend this never happened? I didn’t realise it takes a while to call in these events, so I might have clicked too many times. Now seven meteors have hit the city, as well as two fires and a hurricane, entirely wiping out the district. It’s pretty grim, but on the bright side we’re soon back in profit! The road is now cut off from the rest of the city. Everyone is dead. I name the district ‘Failed Experiment V1’ and pledge never to think about it again. It’s time for a fresh start: Pipville has been through some dark times (of which I’ll take some responsibility), so I rename it ‘Robtropolis’. I name the industrial district ‘Chemical Plant Zone’ and the populated area ‘Bathtub Geralt’. I build a space shuttle, which is never ready in my two years as mayor and therefore never takes off, meaning that I’ve failed my space manifesto. On the plus side, however, I think some of the fun buildings I pop around the city do some good for happiness, which is generally positive during my time—stuff like botanical gardens, a sci-fi skyscraper and a casino/hotel. I try again with my gentrified area idea, buying a new patch of land off to the south east and creating another pentagonal set of roads. What I call ‘New Haven’ goes loads better than Failed Experiment V1—indeed, it’s a thriving district that just has a bit of noise pollution. I give it an expo centre (next to a crematorium—a bold choice by the mayor), a festival venue and some other niceties. It’s a neat blend of dense commercial and residential living areas. I bet it costs a honking fortune to live there. Just like every major city in the UK. Success! Dropping the industrial tax to 1% seems to do some good for the money side of things—I thought this might bring the abandoned industrial area back to life, but it doesn’t. That area is done for, and never recovers. While I tax everyone to hell in an effort to make the city break a profit before 1 May 2025, I end up $700 down on the day, thereby failing the task that Phil set us. I got so close, though. Show me another mayor who would murder loads of their own people with asteroids just to balance the budget. Phil: I was worried this would be a broadly pleasant feature in which we had a nice time building a picturesque city. So congratulations on all of the murders, everybody. Other than the enforced disaster, how did you all get on? 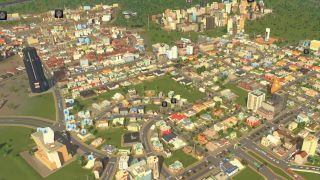 Samuel: I tried to build a new part of the city but instead felt I had no choice but to murder lots of my own people with natural disasters. That was during the era of Pipville, though. Nothing like that happened after the city was renamed Robtropolis. Coincidence? Pip: I want to make it clear that when Pipville was under the leadership of the great and benevolent Pip there was an inﬂux of whales, which are a great indicator of, uh, environmental responsibility. They were clearly attracted by the robust economy or the affordable rent or the thriving nightlife. Maybe all three. If you inherited problems they must have come from Andy. Andy: Going second, I had it fairly easy. Phil didn’t leave many problems for me to deal with, and left me with a blank canvas to make a mess. A mess that resulted in a lot of dead bodies and backed-up sewage. A parting gift from me to Pip.